Queenwood Golf Club, in a similar mould to Loch Lomond and the Wisley, is reserved for its small but perfectly formed membership and their very lucky friends. This is the most secretive golf club in the UK, even a logon id and password is required to access the Queenwood Golf Club website. Secrecy is a great marketing ploy and with membership full and a reputed joining fee of £145,000 it’s little wonder that the club is packed full of golf’s high rollers. David McLay Kidd, son of former greenkeeper Jimmy Kidd, designed Queenwood and the course quietly opened for play in 2001. Jimmy is now the chief agronomist within his son’s design business. 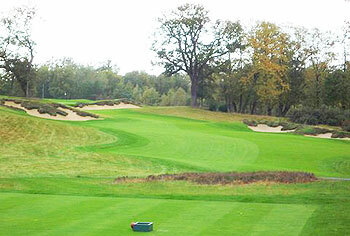 According to DMK Design, “The site is tranquil parkland in west London, an area well known for its classic courses, including Sunningdale, Walton Heath, Woking, Swinley Forest, and more. The area had recently seen some expensive private club failures, in part, I believe, because the courses were too manicured and too predictable. My pitch to the developer, Fred Green, was that Queenwood had to be a departure from that modern style and a return to the heathland traditions of the courses noted above, all of which have stood the test of time”. The Surrey/Berkshire sandbelt has seen precious little golf course development in the last 80 years and Queenwood harks back to the design principles of yesteryear. According to Fred Green, “DMK Golf Designs' modern interpretation of designs from the ‘Golden age of Golf Course Architecture’ in the 1920s has produced results that far exceeded our highest expectations”. If you've managed to play Queenwood, either by sneaking on, or by buttering up Hugh Grant, Michael Douglas or another wealthy member, you’re one step ahead of most of us. We'd love to know what you think about the course. Why not write a review and let the world know how good Queenwood really is? 12th May 2006 - Our thanks go to Mel Chapman who sent in this picture and a couple of other Queenwood images. Mel writes: "I was lucky enough to win a competition to join Darren Clarke at Queenwood on the Friday after he'd just been part of the successful Ryder Cup team in 2004. That man is a real gent and treated us like kings, as did all the staff. And some course it is, Darren reckoned the greens are the best in the country and I'd have to agree, never putted on anything like them. We had the course virtually to ourselves. It was another world! Definitely the best course I have ever played although Carne is not far behind. I'm still waiting for Darren to invite me back!" You know what I was just 100% wrong, its grown into an absolute gem. The Par threes are lovely the greens continue to be amazing in condition and interesting layouts, the purple fours are varied and interesting, the holes that have water are beautiful and frame the holes well and are strategic...played it recently and thought that even if you separate the great service and amazing condition (best greens in Europe), the course now stands on its own two feet. I imagine Queenwood to be one of those places that when the invite to play finally arrives it’s met with a lot of excitement. For UK standards it’s extremely private and what I can only call as an American type high-end private club and playground for the wealthy. The facility is really quite impressive and everything there is truly top class. The driving range facility is excellent, pyramids of balls stacked and waiting, excellent manicured turf and an array of targets. Our caddies were already taking good care of us from the onset. The course I’d have to qualify as a kind of heathland, parkland hybrid with a fair bit of water but excellent firm turf more like heathland. The routing is quite strong but it does give off a more manmade feeling at least for me. The greens are certainly among the best I’ve ever seen in the UK, rolling at like 12-13 on the stimp and being quite undulated, they present a serious challenge, especially on your first go around. I think the course is set up very playable; the fairways for the most part and playing corridors are quite wide. It’s not overly long from the back tees given the perfect playing conditions, but a premium is definitely set on angle of approach to the greens, and with the greens being so fast and quite large it’s really easy to put yourself into 3 putt territory with the tricky undulations. Overall I really enjoyed the experience and would have to say it’s really very hard to beat the 18th hole playing back to the amazing clubhouse from an aesthetic point of view. Given the extremely high average quality of golf in the UK I would not say Queenwood is a standout in terms of architecture and would not belong in the top echelons of English golf with the likes of Sunningdale, Swinley or Royal St. George’s, however it certainly offers a unique high-end experience on a very solid and perfectly maintained golf course in an absolutely beautiful setting and is extremely fun to play. At the end of the day that is what it’s all about, fun and enjoyment. Feel so lucky to have played Queenwood today after playing Wisley two weeks ago and as then, this golf course is in fantastic condition. The greens are really great. However, as a design, the golf course is a little bland. The gorse is too expansive and everyone I talk to can not remember it's great holes. Disappointed with design, but a great experience ( had to have a caddy) and felt honoured. Clubhouse is a little quiet and uncomfortable, which was very different from the warmth at Wisley. So pleased I can tick this one off though, great day, just average course. Good? Maybe. Better than Rye, The Addington, the three W's? No way. There's almost a touch of Mike Strantz about David Macklay Kidd, a certain arrogance which is good when kept under control but can be a bit of a hindrance on occasions. I can't help thinking that any high rating is based on the club, rather than the course. Play it if you're lucky enough to have a wealthy friend that want to pay, otherwise you'd do well to spend your money elsewhere. Is this a course review or a personal attack on David McLay Kidd? Or the way the club chooses to operate? I have been lucky enough to play Queenwood once, which presented me with a day I’ll never forget. I could go on about the level of service and the opulence you receive when the gates open but to me it was still about the golf course. I am aware of Mr McLay Kidd's style of designs, certainly his style of green design, but I found the greens at Queenwood very fair and playable. The bunkering with abundance of heather in and around the bunker is as good as I’ve seen. It may not have the charm of Sunningdale or other established heathland courses in the neighbourhood but it certainly is a very good layout, kept in a condition many can only dream about. 3 ball rating? It certainly isn't that, it's a 5 ball rating with ease and hard not to give it a 6. I agree 100% with Marty. Anyway, if you are going to slag off the course designer you should at least spell his name correctly. Wow not really a review! The golf course has the best greens in the country if not Europe. You are clearly a very high handicapper who had a bad round OR you got turned away at the gate! Without question, the best conditioned golf course in the United Kingdom. This is justified by the USGA specifications throughout the property due to the club being owned by an esteemed American gentleman. Although this extremely private club is very young compared to the legendary Surrey heathland golf clubs within a 20 mile radius, the heath and gorse plays a significant role with the beauty of its layout. The practice facilities are also world class, hence why so many European Tour players belong to Queenwood and spend countless hours working on their games. Similar to Swinley Forest and The Berkshire courses, you’ll find heath sitting on top of the bunkers and strategically placed to separate the rolling fairways. The tee boxes and fairways probably stimp at 10 on any average day, with the greens effortlessly stimping at 12 without batting an eye-lid. The speed of the greens jumps up and grabs your attention, especially if you’ve played the surrounding courses for a few days before your visit. Expect to feel like a King off the course, and then be challenged like a PGA Tour professional the minute you step on the first tee. Queenwood is without doubt a wonderful experience from beginning to end, from the moment you arrive at the gated entrance you are filled with a feeling of great anticipation. The mystique and secrecy that has surrounded this most private of clubs since opening in 2001 and the incredible 6 star service makes the whole experience feel very special indeed. When you arrive at the bag drop area and hand over your car keys you are told that your clubs will be waiting for you on the range with your caddie whenever you are ready. Our host gave us a quick tour of the charming clubhouse which oozes sophistication at every turn from the luxurious guest rooms to the elegant dining room. Just one example of the customer service here …. our shoes were cleaned whilst enjoying a pre-game drink in the locker room and then again after finishing our round. From the Gold tees the course measures 6850 yards so we decided to play from the Blues which at 6475 yards are still long enough to test all but the very best. After a brief warm up we arrived at the 1st tee to be greeted with an inviting downhill drive and the first views of the magnificent Queenwood bunkering. Extremely attractive without doubt but also penal and plentiful, most being clad with heather “eyebrows”, many having fingers jutting down into the sand covered with even more heather. The affect is certainly impressive adding great definition to the holes and framing many of the greens beautifully. The 3rd hole is a short but pretty par 4 of the risk and reward variety where the smart option is to lay up short of the bunkers leaving a wedge to the pin or you can take on the sand in the hope of getting close to the green. The bunkers are well positioned so good strategy is needed here to avoid the trouble. The run of holes from 5 to 7 is probably my favourite section of the front 9, the 5th being a dogleg left with a pond to gather the sliced tee shot and a huge bunker front right of the green. The 6th is a lovely par 3 which involves a carry of about 180 yards to clear the water when playing to the right half of the green. The 7th is another dogleg left playing over 400 yards, the huge bunker on the left side must be avoided you are to have any chance of reaching the raised green in regulation. The downhill 8th offers the chance of an eagle but in reality you may well struggle for par as this is one of the more demanding greens to negotiate. The putting surfaces are magnificent, fast and true and amongst the most difficult I have come across anywhere on my travels. Perhaps this is part of the reason why the course is so popular with practising touring pros as besides the immaculate presentation they always get tour standard greens where landing the ball in the correct areas is imperative. Leave yourself a long putt and invariably you will be left with a ridge, tier or double breaking rollercoaster to overcome. The back 9 begins strongly with water threatening the approach to the right of the 10th and on the tough 11th a watery grave awaits anything pulled left of the green. Holes 12 and 14 are both picturesque par 3’s, bunkers must to carried to get home on 12 and the long narrow green on 14 sits amongst a sea of heather. The 15th is the longest hole on the course with trees running the full length of the hole down the right hand side followed by the memorable 16th where a big drive can easily reach the pond. Choose your club carefully to stay dry and avoid the well positioned bunkers up the left. If successful you must then negotiate a short iron shot over the water to get home. The 17th is a tough 190 yard par 3 to another well protected and undulating green and the 18th is a glorious finishing hole played out in the shadow of the magnificent clubhouse. It’s a shame that such a lovely course is not a bit more accessible but if you are offered a game here grab it with both hands. Played a 4 ball with Andrew Coltart, David Howell and Clive Tucker. I have been involved in golf at the highest end for some 20 years, managing Brocket Hall for some 4 years. The standards upheld both on the course and in the clubhouse are by far the best in the UK, I have played and visited most of the top 100 golf courses over the years, and can only say that the time, money and development of this club is second to none. This is not a course review!! This is self indulgent promotion! Here here. lets have golf course reviews please. As a beginner golfer I was extremely nervous when last summer (2010) an old friend invited me there to play with her and her husband who's a 10 or so. Even the parking lot is intimidating with some of the priciest cars in the world lined up. But once I got in and was fitted with loaner clubs and taken to the practice range, I was in heaven. The caddie was delightful, the course is indescribably beautiful, and with a lot of help I didn't utterly disgrace myself. I may never play another course that is quite so perfectly fitted out for golf in every way. It may be the most exclusive and expensive course in the UK, but it certainly gives value for money and then some. Unforgettable! I had the absolute pleasure of playing Queenwood on March 10th after winning a competition to play 18 holes with the legendary Darren Clarke! Queenwood is quite unlike anything I have ever experienced, it is arguably the most exclusive club in Europe and from the moment you drive through the large black gates you realise you are in golfing heaven. Upon arrival we were greeted by the ever helpful staff who removed my clubs and shoes from the car and to park my car for me. We had breakfast in the locker room lounge area waiting for Darren, after an initial chat with Mr Clarke we headed out to the range where we were greeted by our caddies for the day (thanks Mat, you were great!). The range is superb, the turf you’re hitting on is better than any fairways I have played on and there were buckets full of brand new ProV1’s. The putting green gave us a taste of what to expect, they are lightning quick with some unbelievable undulations and Darren said they were relatively slow compared to how they usually are, he said they’re as quick as Augusta at their peak, I can well believe him! Off to the first tee, and despite my hands shaking and knees knocking I managed to get my first drive off, the course is typical of the quality of courses you get in Surrey. The turf is springy and very easy to get spin from, most of the holes have some form of heather or gorse you need to avoid although they look amazing visually. My scores on the front 9 weren’t great but for me it was the experience of playing somewhere that most people will never get the opportunity to play, some of the holes are simply amazing, it is still a blur at this stage but I loved all the par 3’s and the par 4 10th and 16th were my favourite holes and I managed 4over on the back 9 so I came away very happy indeed and Darren and I won our match against his colleagues from TaylorMade. The greens really are something else, you will not putt on better greens anywhere in this country, and they’re relaying them next year so can’t imagine how good they’ll be then. This whole place oozes class and exclusivity, the pro shop is small but perfectly formed with some nice looking clothes all bearing the Queenwood logo. The clubhouse is big and looks like it’s been around for years but the club has only existed for 10 years which beggars belief really as it has the feel of somewhere that’s been around for a long time. I didn’t want the day to end and it dawned on me that I’ll probably never get to come here again in my lifetime which is a strange feeling really, but Darren was absolutely brilliant, a top guy who is totally grounded and very honest about his objectives this year and about some of his playing colleagues! Just before we left I bumped into Jaime Redknapp who is a top bloke and chatted to us for a few minutes, that left a final indelible mark on us and topped off an amazing day and one that probably won’t be repeated. I had the pleasure of being invited to Queenwood last August. For me the privacy and sheer elegance of the place did it for me.From the moment your car stops at the valet park sign you know you are somewhere special.You walk into the locker room where the attendant takes your golf shoes and cleans them to perfection,he then hands them back and tells you you can now walk anywhere in the clubhouse in them. Straight into the bar for some breakfast and to be met by my host. Service 5 star. Looking out of the window my clubs were on the range awaiting my arrival. The range is full of baskets of Pro V 1's just hit as many as you want. 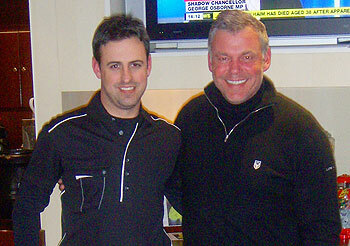 Darren Clarke had arrived with his coach,nobody bothered him he was just another person. Your caddy then arrives in a white boiler suit and watches you hit shots,to get a feel for your game. A quick walk to the putting green then off to the first tee. The course is as hard as you want to make it by which tee you go off. Everything is just perfection about the course,teeing grounds cut really short and firm,fairways just beautiful,not a weed in sight. The bunkering is all covered by beautiful heather and is just a delight to see. The greens are quick and lovely. My whole day from start to finish was just a memorable occasion,and lucky for me my host has invited me back this year. "CAN'T WAIT"